Bykerk Southbelt Storage is located at 5150 – 68th Street SE (1/2 block west of Broadmoor) in Caledonia, Michigan, just minutes from M-6, I-96 and downtown GR. We serve Grand Rapids and surrounding areas, including: Ada, Alto, Alaska, Byron Center, Caledonia, Cutlerville, Dutton, East Grand Rapids, Forest Hills, Grandville, Kentwood, Middleville & Wyoming. We are a full service self storage facility and take great pride in providing individuals and businesses with the most secure outdoor storage and indoor self storage experience while making it affordable and convenient. Bykerk Southbelt Storage also offers climate controlled self storage for your temperature sensitive items. We offer a variety of locks, boxes and storage packing supplies to ensure that your belongings are properly packed for storage. We understand the moving and storage process can be frustrating, and we are here to help you during every step of the way. We offer free automatic credit card billing and accept Discover, Mastercard, Visa, American Express, Cash or Check. Along with our 45 state-of-the-art surveillance cameras and 24 hr monitored perimeter intrusion system, we provide a fenced and multiple gated self storage facility, with computerized entry and convenient access 24/7/365. As a courtesy to our customers, we provide snow shoveling of all unit doors so you will have clear access to your storage unit at all times. 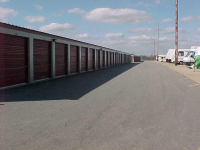 Call Bykerk Southbelt Storage today for information regarding availability of our storage units at 616-698-7360.